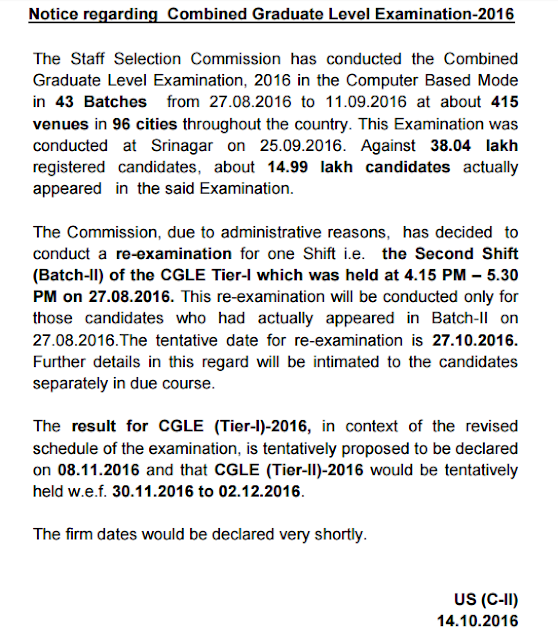 Today SSC has issued a Notice in its official website ssc.nic.in regarding Re-exam of one shift of SSC CGL 2016 Tier 1 with Probable Date of Result (SSC CGL 2016 Tier 1) and Tier 2 expected date for SSC CGL 2016 Examination. You may Download the official Notice from the link provided below. The Commission, due to administrative reasons, has decided to conduct a re-examination for one Shift i.e. the Second Shift (Batch-II) of the CGLE Tier-I which was held at 4.15 PM – 5.30 PM on 27.08.2016. This re-examination will be conducted only for those candidates who had actually appeared in Batch-II on 27.08.2016.The tentative date for re-examination is 27.10.2016. Click Here to Download the official Notice from SSC.NIC.IN regarding Tier 1 Result and Tier 2 Tentative Dates.